In January I went to Zimbabwe for two months to do some volunteer work and to join Nicholas Duncan and his group for the February committee trip. The last time I visited Zimbabwe was in 2008, when the country was going through a period of hyper-inflation. However this time the country was in a much better state, and even though prices were high it was nice to see stores stocked up again. For my first couple of weeks I was staying with Paul Trethowan, a wildlife ecologist doing a doctorate on lions in the Bubye Valley Conservancy, a 380,000ha hunting concession close to the South African border. This time of year is the rainy season in Zimbabwe, but unfortunately up until the day I left Australia not a single drop had fallen. Just before I left I received a message from Paul saying that they had had a huge amount rain and when I arrived at Bulawayo airport, I was greeted by a sea of green, showcasing the country at the height of its natural beauty. In that part of the world, when it rains, it pours, and though the locals and wildlife were grateful for the relief the rains brought, it did make working conditions much more difficult. As the weather worsened, it became too hard to drive on the roads in the conservancy, so Paul and I decided to visit his parents neighbouring property. After a few beers on the veranda, it was mentioned that the Umzingwane had overflowed enough that it was about waist deep and before I knew it with a drink or two in my pockets, we were jumping in with big inner tubes and going on probably the most beautiful river cruise I have ever been on. When I woke the next morning after staying the night, we found that the river had not only risen 3m but had engulfed and deposited several large trees on top of the only bridge back, cutting us off for 5 days. Though it is a hunting concession, Bubye has an astounding amount of wildlife including the big 5 with a very large population of lion, which I found out first hand on my first day checking lion kill sites on foot with Paul’s research assistant, Roy. As we were checking the GPS co-ordinate of the second kill site, we decided to split up to cover more ground in trying to find the carcass, but agreed to keep each other within sight. At this time of year, the bush is very dense and within minutes I couldn’t see him anymore and got slightly disorientated. Having nothing except my bush knife to defend myself I begun to feel very uneasy and it seemed like forever until we finally found each other. Just as we were agreeing that we couldn’t find anything we started hearing a large female lion roaring from 100m in the direction I was just in, proving my suspicion that I should’ve been worried. Though vehicle issues aren’t uncommon in Africa, we seemed to bear the brunt of what can go wrong to a vehicle with the SARF Delica on this trip. After having a new engine put in, we first began to run into problems with the Delica while I was staying with Verity who runs the Dambari Wildlife Trust in Bulawayo. We were informed by Hans, who runs Cheetah Conservation Zimbabwe with his wife Esther, that the engine was leaking oil. Though pushed back a day, once fixed at the mechanic’s, the vehicle worked well up to Harare where we would be meeting everyone for the committee trip, however on the second day after visiting the Bally Vaughn Sanctuary, the temperature gauge began to red line, meaning we were set back another day, while it was being fixed. Once fixed, we had no issues for the rest of the trip until we had dropped off everyone else off. I was staying a bit longer, but the car decided it had enough and no more than 150m drive from the Airport, I heard a big bang come from the engine and smoke began to billow out of the exhaust. One of the great things about going on the committee trip with SARF is that not only did we get to see a huge amount of the country, but also had the opportunity to do things the average person would never be able to do. During our time in Savé Valley Conservancy, we met African Painted dog researcher Rosemary Groom, who showed us 3 packs of African painted dogs. As I hadn’t ever seen a painted dog in the wild, seeing 30 together was extremely thrilling. Another example was when we went to Gonarezhou, a National Park being rehabilitated by Frankfurt Zoological Society (FZS). Gonarezhou, meaning place of elephants in Shona, was true to its name and we saw many of them, including very angry elephant who refused to let us pass for 40 minutes. Though seeing these creatures up close is a thrill in itself, we were lucky enough to be taken up by Hugo from FZS in his plane and we had a spectacular view of the park from the air as the sun was setting. If that wasn’t enough, the next day we were invited by Malilangwe’s head of security Mike Ball for a rhino walk where we saw a group of 5 black rhinos from about 30m away. 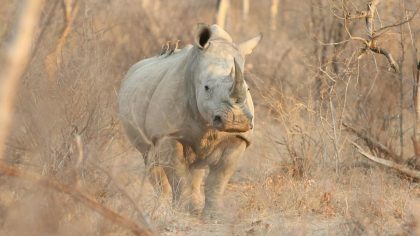 As black rhinos are solitary animals this was an incredibly rare experience. When everyone from the committee trip went home to Australia, I stayed back to work at Savé Valley Conservancy. Though only 420km from Bulawayo, this was a long and very cramped public transport or ‘chicken bus’ (I’ll leave it to your imagination why it’s called that) ride. While in Savé, I helped Dusty Joubert, a wildlife ecologist, with the tail end of a leopard project he’d been working on and wanted me to help try and remove the collars on the remaining leopard. The difficult thing about leopards is that they are particularly elusive and the only way to remove the collars is to set up a bait and hope the one you’re looking for happens to show his face. After a couple of days we identified a male and decided to camp out to try and dart him. Just before dark, Dusty, his assistant and myself crammed ourselves into a tiny 3 man tent and prepared for a long night waiting. Unfortunately the leopard never showed up, either he wasn’t hungry or could hear my snoring from across the bush. On the day of my flight I wished that I could’ve stayed a bit longer, but little did I know that my wish was about to come true when, when at passport control in Harare, I realized that my passport had gone missing. Even though I rushed back to the hotel I was staying at, it was nowhere to be found and I had to get an emergency replacement from the Australian consulate. Unfortunately, because of the long weekend in Australia, I was unable to get a flight for 4 days, so upon recommendation from Pete Musto, who graciously helped me sort out my passport and gave me a bed for my nights in Harare, I rented a car and drove up to Umfurudzi Safari Area. Though it was great see more of the country, I was a bit glad to step through the gate and know I’m definitely on my way home. I’d like to say a big thanks to the Trethowans, Leathems, Verity Bowman and the Dambari Wildlife Trust, Clemences, Jouberts, the wonderful staff at Mazunga and Sango and Pete Musto for all their hospitality and kindness, Nicholas Duncan for helping me organize such a fantastic trip, and everyone on the committee trip who made it such a fantastic adventure.